In the past quarter, sales of plug-in cars in California amounted to 35,466, which represents 6.9% of the total volume and growth of 58% year-over-year, according to the California Center for Jobs and the Economy. Currently, the biggest gains come from all-electric models, as 19,358 were sold during Q2 at 3.7% market share and growth of 68%. The strong results put California on track to reach its long-term goal of 5,000,000 plug-ins by 2030 (1.5 million by 2025). Currently, cumulative sales stand at roughly 430,000, which is 8.6% of the target (4.4% of that falls on BEVs), but we don't know how many of those cars were destroyed in accidents or sold to other states or countries - it's estimated that real on-the-road number could be 7.9% or 395,000. Interesting is that hybrid cars are on the downward trend both in terms of volume (-15%) and market share (4.0% compared to 4.7% year ago). Most PEV sales continue to come as consumers otherwise open to an alternative fuel vehicle shift to plug-ins rather than buying a standard hybrid. 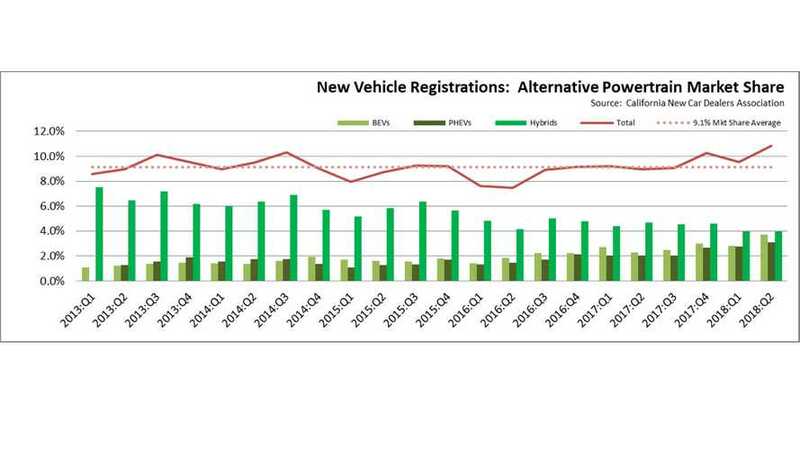 As shown in the chart below, total market share for all alternative powertrains (BEV, PHEV, HEV) has deviated little from the long term average of 9.1%. The only significant differences: (1) 2017:Q4 saw a 10.2% share but was likely driven by consumers’ expectations—driven in turn by dealers’ advertising—of a possible subsidy cut in the federal tax reform bill, a likelihood that is illustrated by a dip in the following quarter; and (2) 2018:Q2 which was affected heavily by the next factor below. Tesla finally began significant shipments of Model 3 from prior orders. Tesla’s sales in California were up 9,815 from 2017:Q2, of which 8,951 were Model 3 shipments for orders posted in the prior year. These sales may indicate that a break from the 9.1% long term market share may finally be taking place, but more than one quarter of data and sales generated by current rather than prior-year consumer decisions will be needed to show a change in this trend. Counter to previous expectations that Model 3 would finally represent a break-through in BEV prices that would open up electric vehicles to a wider market, current deliveries are at a price point that keeps this model in the near luxury category, limiting its future ability to appeal to a wider segment of the market. The future direction for PEV sales is also uncertain as a result of a looming shift in the subsidies available to buyers of these vehicles. As indicated by prior experiences in Denmark, the Netherlands, and—within the US—Georgia, PEV sales are highly sensitive to changes in these subsidies. California has already made substantial cuts to the availability of its rebates by imposing income limits for eligibility. Tesla appears to have breached the total sales threshold for its models to be eligible for federal rebates, and GM appears to be few quarters away, with Nissan at 60% and Ford at 55% of the cap. Once the cap is reached, federal subsidies are phased out over the following two quarters. While these more public subsidy sources are declining, ZEV producers also have available subsidy revenues as the result of selling regulatory credits, both for compliance with the ZEV rules in California and the other adopting states and under the federal fleet fuel efficiency standards. While shifting the subsidy cost incidence from government budgets to those consumers buying traditional fuel vehicles, the associated scale was also likely set to increase under rules made final in the last few days of the Obama Administration. While these regulatory credits will still retain considerable value as a subsidy source even under the recently proposed rule revisions, there is likely to be a period of uncertainty until the rules are finalized and the announced litigation is eventually resolved. Consequently, the current quarter sales results are too premature to determine whether a longer term shift in consumer acceptance is taking place that would broaden the market share for these vehicles. This outcome will not likely become known until additional quarters’ worth of data becomes available from sales as ZEV producers set pricing closer to the costs of production as both the state and federal subsidies subside."